When I was younger, Transformers: Robots in Disguise were all the rage. The multipurpose machines dazzling kids all over the world with their amazing feats of alteration. 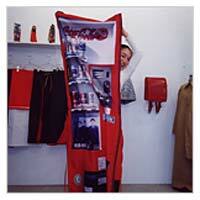 Unfashionable Skirts: Vending Machines in Disguise however may not have quite the same impact. With this attire having such a limited use, it will presumably remain a one-off piece of art rather than making it as a mass-produced garment/cloaking device. That said, it could be useful for criminals wanting to evade the police. Or alternatively, a wacky aid for pranksters looking to surprise thirsty commuters. Like these unsuspecting and not very observant beverage buyers. is there a similar product for vending machines where they can disguise themselves as humans? When I first went to Tokyo, I was amazed at the plethora of vending machines. In the UK, such things would get vandalised and robbed within half an hour of being put in place. I particularly favoured cigarette machines, as they allowed me to buy my daily fags without recourse to any tricky foreign language use. About three years after this, a new generation of cigarette machine began to appear on street corners. Instead of having the packet receipt tray at the base of the machine as the old ones did, the new machines now featured it at waist level. And emblazoned across the front of these new machines was the legend: ‘No bending vending’. and further to englishman`s comments, If not why not? A bit rough on the arms though. I could probably keep it up for ten mins. Which is enough time for the baddies to run past me. Also good in the ‘caught in a dead end’ situation, I would think. I want one that looks like a door. I would really like to buy one for a friend. Does anyone know where I can buy one?